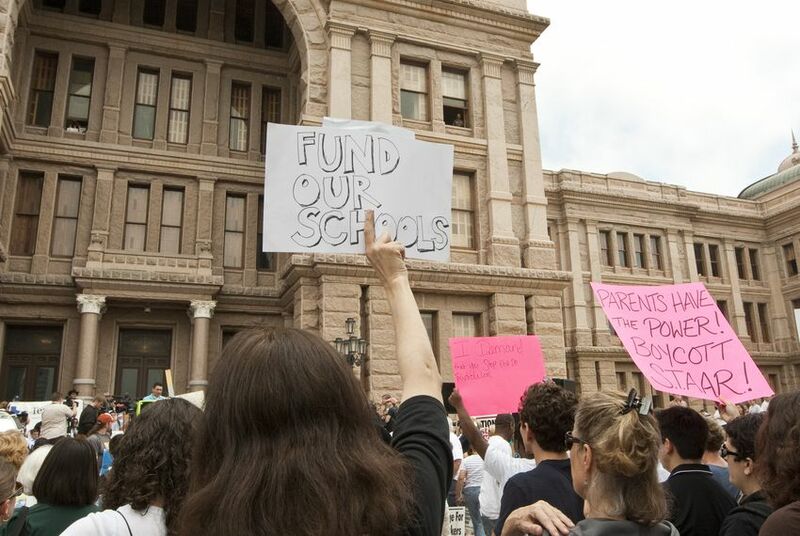 A coalition of nonprofit foundations and the Houston-based advocacy organization Children at Risk have released the initial findings of their comprehensive report on how the 2011 budget cuts have affected public schools. How Texas public schools coped with the $5.4 billion state budget cut in 2011 is sure to dominate the conversation at the Capitol about school funding in 2013. In advance of the next legislative session, one group aims to provide comprehensive data on exactly what has happened. A coalition of nonprofit foundations and the Houston-based advocacy organization Children at Risk released their initial findings Thursday at a Capitol press conference. There are two immediate take-aways. First, districts absorbed the cuts in diverse ways. Second, many of them were unable to do that without laying off teachers. Despite an average increase of 83,000 students statewide in each of the last four years, districts eliminated more than 10,000 teaching positions last year. That came as about a third of districts dipped into their emergency fund balances in 2011-2012 to compensate for state shortfalls. The report also examined the cost-cutting strategies districts have employed to help cushion the impact of the cuts. Common tactics included "increased collaboration among districts, diversified revenue streams, low administrative overhead and achieving economies of scale where possible." However, it said that "even the most creative districts were only able to achieve comparatively small savings from these strategies with regard to total operating budgets." The findings released Thursday are from a 22-item questionnaire sent to a representative random sample of 120 school districts and a separate, nonrandom sample of 17 large, urban school districts. The data collection took place from April to September 2012. Researchers also conducted site visits to districts across the state, interviewing teachers, principals and guidance counselors to learn how the cuts affected their daily routines and campuses. A second survey has been sent to the remainder of the school districts, and the results will be released in January 2013. From the interview portion of the study, the report found several recurring concerns among educators. They included the loss of one-on-one time with students, money for remediation, planning periods, elective courses and off-site learning opportunities for students such as field trips. There were also areas where districts experienced no change between the 2010 and 2011 school years. Pre-kindergarten offerings remained the same among 85 percent of those surveyed, despite the elimination of about $200 million in state grant money for the extension of half-day programs to full-day. Of the districts that reported no change, 46 percent offered full-day pre-K, 49 percent offered half-day pre-K and 5 percent offered no pre-K. About 15 percent of districts reported a change from full- to half-day pre-K sometime during the three-year survey time span, and 900 children were in pre-K programs that switched from full day to half day. To keep full-day pre-K, many districts have eliminated other programs or started to charge tuition. The city of San Antonio is asking voters for a sales tax increase of one-eighth of a cent to fund full-day pre-K, primarily for low-income 4-year-olds in the city. The districts included in Thursday's report represent about 36 percent of the state's public school enrollment.